A sweet mashup of virtuality and physical presence is this artwork by Golan Levin. 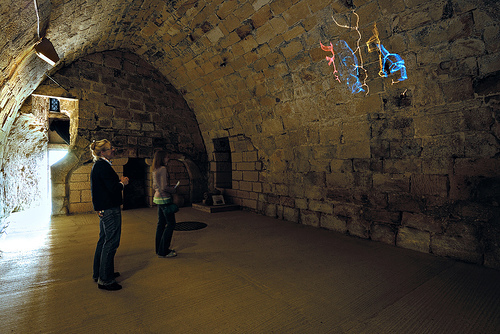 Called Ghost Pole Propagator, it projects a “skeleton” of each visitor onto the stone walls of a castle. 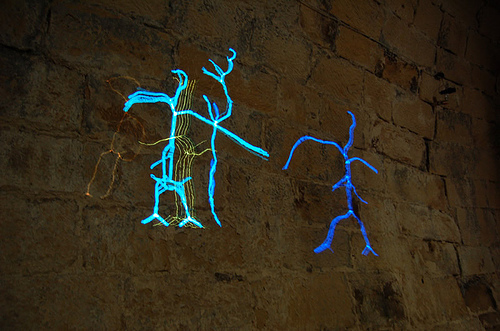 This projected stick figure then mimics the actions of the visitor(s). You are the show. Golan Levin is an ace programmer in Processing, a language that herds massive numbers of visual fragments, which he applies in art works.